It is very important that you read and understand this policy in its entirety before trial. 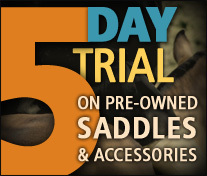 To reserve saddles and/or accessories for trial, please check them out online. We place a hold on your debit or credit card for the price of trial-able items and run a separate charge to cover shipping and any non-trial items. From the day of delivery you have 5 days to ride and evaluate fit. You must notify us within those 5 days if you are returning any items. All items must be returned to us in the same condition that they left us in. Shipping insurance is required for the full value of all items returned to us. We want you to be confident with your purchase, and that is one reason why each of our pre-owned items is offered with a trial period. Please note that saddles and fittings are not guaranteed or warranted by FUS beyond those 5 days, but manufacturers warranties might still apply. 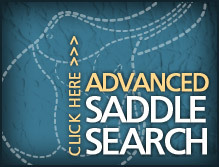 Every saddle you check out online will be considered a trial unless you are outside North America. Within the US you may try up to three at once. You may check out securely online with either a credit card, debit card, PayPal, or you may also specify for us to call you for payment information instead through ticking the "credit card by phone" payment option. For credit cards, we place a temporary hold that affects your available credit while you are trying the saddle, but does not affect your balance unless you buy. With a debit card, we do still place an authorization but it does actually tie up those funds. Many debit cards have a daily transaction limit, so you may need to call your bank and ask for a temporary increase on that limit. For both credit and debit cards we process shipping as a separate transaction, a charge that is automatically final. Shipping charges always include full insurance coverage. For your convenience, packages will be left by the carrier by default. If your location is not secure, please do ask that we require a signature. From the day of delivery you have five calendar days to ride in and evaluate the saddle. 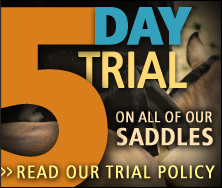 If you receive the saddle on a Tuesday, for instance, the first day of your trial would be Wednesday. If you decide the saddle is not right for you and your horse, or if for any reason you are dissatisfied, you may send it back to us in the same condition as was received. Your only financial responsibility is ultimately the cost of shipping both ways. When you are trying one of our saddles, please take care to wear breeches. Jeans put more wear than necessary on fine leather. 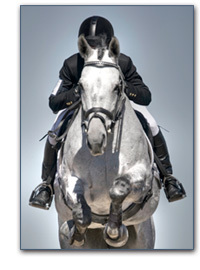 Please avoid half chaps or boots that may have a zipper or rough spot of any kind contact and possibly mark the saddle. These precautions will minimize the risk of wear. Please wrap your leathers. We make it easy by providing you with tube socks to slip over your leathers during trial. Please use a clean saddle pad and keep the saddle free of sweat marks. Please do not apply any leather products (cleaners or conditioners) until you have decided to keep the saddle, unless product-specific permission has been given to you personally by FUS. Save the original shipping carton and original packing materials. If you need to make a return, please be sure the box has remained sturdy enough for another trip, and pack the saddle exactly as it was when you received it. Use plenty of tape to secure the package, especially on the bottom. The box is likely to be dragged around in shipping and we don't want it coming open. DO NOT EVER send us styrofoam packing peanuts or anything like them and we will never send them to you. They are a scourge on all humankind! Well, they are troublesome for us at least. You must notify us before the end of your trial period if you plan to return the saddle. If we do not hear from you within the 5-day period a saddle is considered sold. If you need an extra day or two you must let us know before the original 5-day period is over.VERY IMPORTANT: Fine Used Saddles cannot offer any guarantee or warranty beyond the trial period on used saddles or any other second hand items. However, in many cases the maker's original warranty will still apply so don't hesitate to ask us about that on any saddle you are interested in or are trying. While we very carefully check all saddles for soundness and describe everything in as much detail as possible it is up to you to make your own final call on the suitability, condition, soundness and fit of your purchase according to your needs before committing to it. We welcome you to get a professional, hand's on third party opinion during your trial and are happy to answer any questions along the way. 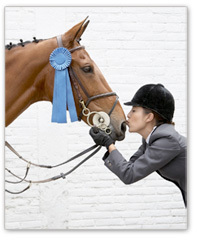 A prepaid FedEx shipping label for return shipping is included with all saddle orders for your convenience and savings. The cost of return shipping by this method will be equal to your initial shipping cost if you chose FedEx Ground and always includes insurance. The cost will be charged to your credit card upon receipt of your return. You need only to sign the credit card authorization, insert the return label into the clear pouch provided, apply it to the box, and drop it off at a FedEx Ground drop off point such as a FedEx Office store. Check to be sure there is a FedEx Ground drop off location in your area. We can also schedule a pick up at your home or office, but FedEx does charge a $13 fee for pick up service that would also be billed to you in addition to the indicated amount for shipping. Please let us know if you need a pick up scheduled as we will have to call it in. If not using the included return label, it is required that you purchase shipping insurance. All returns must be insured and shipped by either US Postal Service Priority Mail (NOT Parcel Post), FedEx Ground or UPS Ground, and are the buyer's responsibility until we have them safely back in the original condition they left us in. Upon receipt of the returned saddle we will initiate the void of the transaction within two business days, but in special circumstances it might take slighlty longer. This may take a few business days to clear your financial institution after submittal. Any damage to a saddle will result in a fine or refusal of return, depending on the extent, at the discretion of Fine Used Saddles. Examples of damage include but are not limited to scratches, stains, dings, excessive wear, torn leather or a broken tree. As long as you are careful you should have no problems. Keep trial saddles at home inside, and away from critter claws! Please DO NOT leave saddles in a hot or cold car, but keep them locked away safely in a climate controlled environment. This same basic policy applies to pre-owned fittings. Be careful, be safe, and have fun! In trialing and/or purchasing a used saddle or any other used accessories from us you certify to acknowledge, understand and agree to all of these terms.